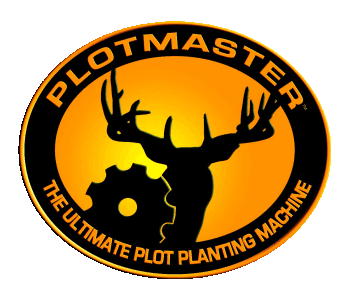 ‘The Ultimate Planting Machine,’ The Plotmaster™, by Plotmaster Systems LLC., with it’s patented design is the complete package for your plot planting needs. The Plotmaster™ Hunter 400 (4-ft model) will reach places you’ve only dreamed of planting plots. It’s easy and simple with the Plotmaster™. The Plotmaster™ is constructed of heavy-gauge steel tubing for many years of continued use. It was designed to be used in even the roughest of environments, including hard, virgin soils that have never been cultivated. the unit for transport and proper depth control for tillage. Each Plotmaster™ comes with a one-point hitch system. Therefore, it can be pulled by ATVs/UTVs (500cc or larger for the Hunter 400) (300cc or larger for the Hunter 300), or large lawn tractors. *NEW Feature* For added Versatility, change out the One-Point Hitch System with the 3 Point Conversion Connector (sold separately, PT# H-PHC-101-08) and the unit is ready to be used with any 25-40 HP Tractor! "Photo Courtesy of Appalachian Trophy TV"
Each Plotmaster™ Hunter Series comes with “double gang” assemblies, (1) gang is positioned on the front and (1) gang on the rear of the unit, each consist of (6) 16-inch heavy-duty discs with Sealed Bearings. The gang assembly is used to disc and break up the soil prior to planting. With a revolutionary custom-designed electric “Versa Seeder” (patent pending) you can plant virtually any type of seed, from Native Grasses to Corn. It dispenses directly behind the area you just cultivated rather than broadcasting your seed in areas you do not intend to plant. This reduces costly seed loss. 16" Pneumatic tires make the Plotmaster™ easy to transport virtually anywhere and retract electrically with our new Linear Lift System, with a push of a button, when you are ready to cultivate and/or plant. Flexible metal grating attached to the drag bar provides a smooth “infield” finish and helps provide even coverage of soil over your seed for improved production. It can also be used to smooth and prepare your seedbed prior to planting in rough, uneven areas. Multi-use, spring-loaded cultipacker has adjustable tension, it can be used to level the soil and cover the seed with the proper amount of soil for optimal production. The unique cultipacker is designed to pack the soil and ensure good soil/seed contact, which greatly improves seed germination. Working in tandem, the Plotmaster™ can disc in a cross-cut manner, deposit the seed of your choice, pack the soil, cover the seed and smooth the soil over the seed all at the same time. No other implement on the market comes close to the versatility, capability and durability of the Plotmaster™. The unique “Down Pressure System” is designed for the user to distribute the cutting pressure of the disc where needed. The Top Link can be adjusted to put more pressure on the front disc or can be used to apply the pressure to the rear disc. When planting the Plotmaster™ should be level to get the correct coverage with the Drag and/or Cultipacker. Both the Hunter 300 & 400 Models are delivered via LTL, (enclosed truck). Residential deliveries will arrive with lift-gate service. The lift-gate will lower the unit to the ground so the customer can gain access. All sales are final and deposits are non-refundable. Business deliveries with forklift access do not require lift-gate service.